The Embassy Moved, But Did Anything Change? The United States embassy is now located in Jerusalem, the eternal capital of the Jewish people. Many people have asked my opinion about the impending relocation in the last few months. I have been reading and thinking and looking to people whose on-the-ground knowledge has helped me in trying to manage my emotions and approach recent events with an analytical mind – for me, a most challenging task when it comes to Israel. One of those people I look to is Ambassador Dan Shapiro whom I have been honored to know since our days on staff at OSRUI, the Reform Jewish summer camp in Wisconsin. Dan served as the U.S. Ambassador to Israel under the Obama administration for seven years. I have learned so much from him about Israel in general and this issue in particular. He has spoken and written extensively about the embassy move. At a time when some in the Jewish community were speaking out against the move, Dan offered a compelling perspective. What I’ve learned from Dan is that moving the embassy could help advance peace in the middle east, and, by itself, doesn’t change anything. There is no doubt that Jerusalem is the capital of Israel. It has always been that way in fact. The United States was the first to recognize the new State of Israel when it declared independence in 1948, and now it is leading the way once again in placing its embassy at the seat of Israeli governmental power. Other nations are now following suit. And, this shift doesn’t change reality for the Palestinians or the Israelis. For Palestinians who dream of a state of their own with Jerusalem as its capital, this move doesn’t change a thing. The U.S. Embassy was relocated to a place in West Jerusalem that would never have been given to the Palestinians in a negotiated settlement. If Palestinians are serious about self-determination, Palestinian leadership will need to decide to negotiate, to stop incitement against Israel, and to accept the reality that Israel is not going anywhere. It must focus its energy and resources on taking care of its people, not building tunnels to terrorize and threaten Israel. And for Israelis and lovers of Israel around the world who dream of celebrating her 80th and 90th and 100th birthday as a Jewish and democratic state, the move of the embassy changes nothing. For there to be a secure future for our beloved Jewish state, the only path is a negotiated two-state solution. The leaders of Israel and all who support her must work relentlessly to achieve that goal. To thrive for decades to come, Israel cannot continue to occupy millions of people to whom it grants neither equal citizenship nor independence. For Palestinians and Israelis, the fact that the U.S. Ambassador now wakes up a mile or two from both the Knesset and East Jerusalem instead of an hour’s drive leaves their reality unchanged; it doesn’t change the past, present, or future plight of the peoples who share this sacred land. That future remains in their hands. I pray that both will seek peace because even after last week the status quo persists. And the status quo is simply untenable if there is to be peace. I know this is a difficult and complex subject for so many of us. I invite you to wrestle with these issues, and I pray that we will all do so by engaging with these challenges face to face, respectfully. 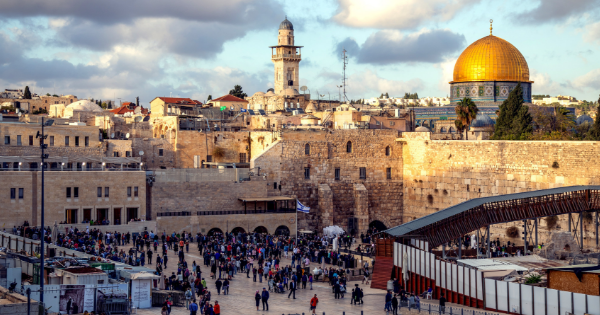 As a congregation deeply connected to the land and people of Israel, we remain steadfast in our dedication to actively fostering a strong, committed, and nuanced relationship with our beloved and beautiful homeland.